Nu-skool Detroit dub head Luke Hess has handed over a selection of tracks from his well recieved 'Light In The Dark' album for remix treatments from Marko Fürstenburg, CV313 and Mikkel Metal. Steve Hitchell's CV313 mix is another of his deeply padded and ethereal productions, transforming 'Reel Life' into a swelling mass of rich analog bass hits and semi conscious dub atmopsheres. 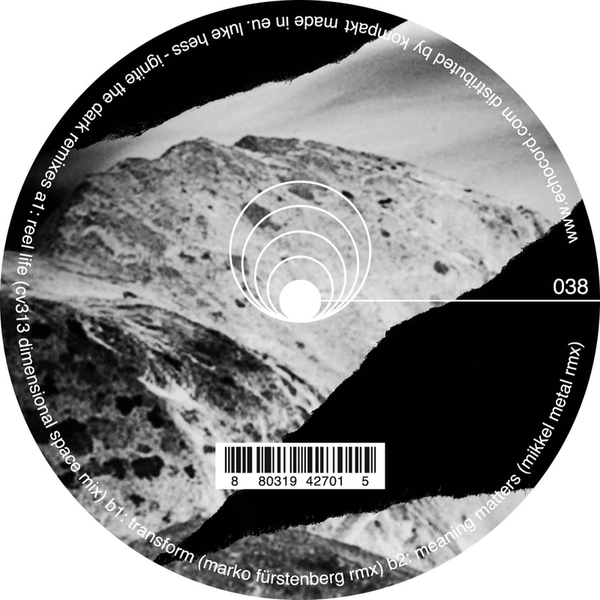 His dub-techno allie Marko Fürstenburg provides a hypnotically powerful mix of 'Transform' with beautifully weighted bass and spacious reverbs, while Mikkel Metal turns in a heavy groovin' house mix of 'Meaning Matters' for early morning play. Tidy.